Yesterday morning, a friend forwarded something to my “in” box that at made me laugh. Of course, the humor (or lack thereof) surely depends on the perspective. 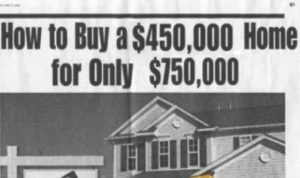 I doubt, for example, I would have found the ad amusing had I been the realtor who had placed it. It’s equally unlikely that the copy editor responsible for proofreading prior to press was tickled. My mailman indulgently nods, though he has a somewhat bewildered look on his face as he quickly pulls away from the curb. 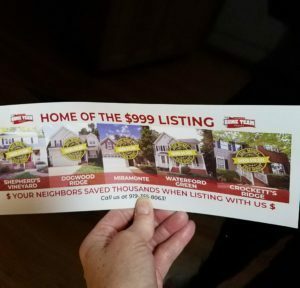 I am glad the scene isn’t trending on some Facebook foolery page, but I am sorry the mailman didn’t know the card I really was referring to had fallen to the ground. These are my friends, Tonya and Mike Proctor. 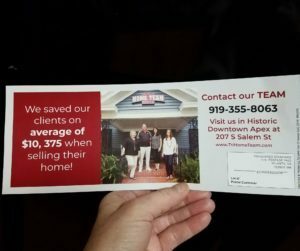 It was so fun to receive this mailing and realize how proud I am of Mike and Tonya, as well as their Home Team Realty Team.